The other day Blockbuster sent me a Speed Racer DVD containing about a dozen of the original episodes. 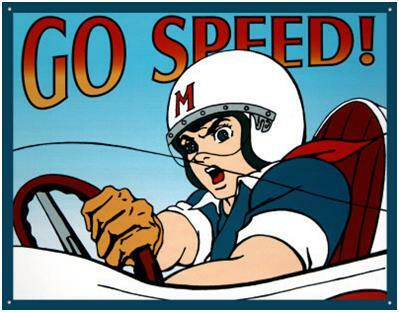 Having grown up with Speed Racer, I had high hopes for a good time racing down memory lane, but I've got to be honest and say that overall it kind of blew. The main problem with Speed Racer is that it's boring. As a kid I remember a lot of fighting, and cool car races with spectacular crashes and explosions. The fights and crashes were still there, but as an adult what really stood out to me were the long, boring stretches of cars just racing with nothing else happening. Oh, and the dialog is really corny and sexist, which was sort of enjoyable. One thing I always remembered from the series was the episode with Trixie's dream. In her dream Speed pulls up in the Mach 5, jumps out and stands there with his back to her. She runs up behind him and when he whirls around he's turned into a devil. This episode scared the crap out of me as a kid. For more than 30 years I've remembered this scene, and in my mind it still seemed scary. However through the beauty of YouTube I was able to watch this scene again. Click HERE if you dare. It's interesting how what the child's mind considers pants crappingly scary, just seems hokey to the adult. Watching this scene today, I can see that Speed looks more like a cat than a devil, however after watching it my memory still tells me that it's scary, even though my present mind just saw it and thought it was stupid. Strange, huh? Now if you'll excuse me, I need to go change my shorts. Leigh - any pics of the filed teeth? mk - Kind of like the Flintstones when they ran through the house past the same furniture. CM - The flying monkeys never bothered me. Now Miss Gulch? That's another story. It's funny how we remember things as kids. Those stupid monkeys in the Wizard of Oz were terrifying to me when I was a kid. I guess I'm a little old to remember Speed Racer. It wasn't so much that it was boring, but how many times were we subjective to that stupid car going past the same trees? Also, how the hell did it "bounce" down the mountain every race and end up with NO damage? Just a thought..
this show scared me too. those teeth are scary. they look like mine did when the dentist ground them down for my veneers.